I lived in Philadelphia for 35 years, and outside of one aborted attempt, I never tried to go shad fishing. Not once. Many do, and look forward to the annual event, to the point that there is even a Shadfest in not-too-distant New Hope (PA) & Lambertville (NJ) that celebrates the rite of spring. When I moved to Florida, I learned that shad also run all the way down here...who'd a thunk it? Not me at least. I thought Florida was redfish, speckled trout, and snook. 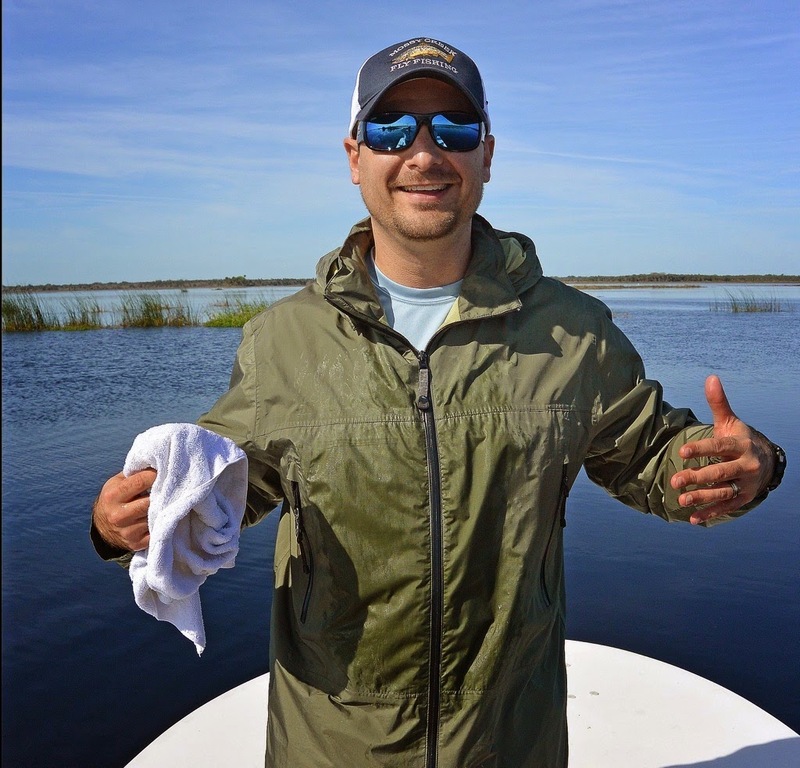 I also discovered that the same guide that took me out for flood tide redfish in kayaks last fall, Captain Rich Santos of First Coast Fly Fishing Unlimited, also ran guided trips to go and catch them...well, that was an immediate no-brainer that I decided to address come the new year. 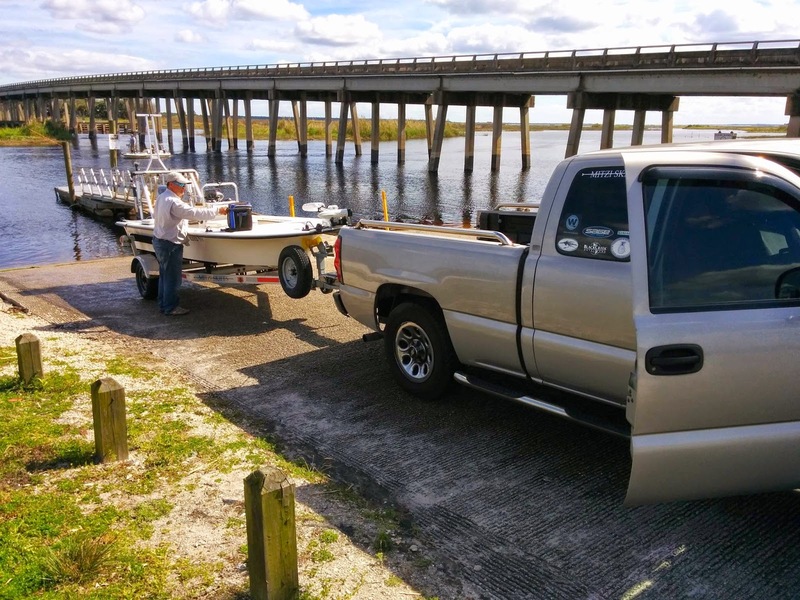 Unfortunately, due to whatever Mother Nature had up her sleeve (mostly high water levels) the shad decided to run a little later this year, so our January trip turned into a February trip, which happened to be last Saturday. Being a total newbie to this type of fishing, I learned 4 things about shad. I'm smiling through the pain in this picture, my left pinky finger is hamburger. (Actually, it's not that bad, nothing a quick band-aiding couldn't fix). Let's just say that I don't need another photo of a shad in hand and "keep 'em wet" will largely apply from now on. Like incredibly slimy. Like Ghostbusters slimy. Like imagine if your fish came out of the water drenched in an inch thick layer of KY jelly. I tried to hold the one above and it started going into convulsions so I tried to brace it against my chest instead of having it flop around the deck of the skiff. Um, yeah...not the best idea. What a blast! The biggest one of the day was just above 19 inches long, and very thick. Awesome fight, complete with acrobatics! Shad like to run, jump, all that fun stuff. But enough about the shad. The experience of fishing is always about more than the fish you're chasing. The area of Central Florida that Captain Rich took me to was very interesting. It's the headwaters of the St. Johns River, so the waterway is far more narrow than up north where I live just outside of Jacksonville. It also happens to run through some fields, pastures, whatever you want to call them, that houses an incredible amount of animal life. Livestock such as cows and horses graze the banks (under the shade of palm trees of all things...which is kind of a foreign concept to a Yankee), while flocks and flocks of different bird species are everywhere. We even saw a camera-shy bald eagle. 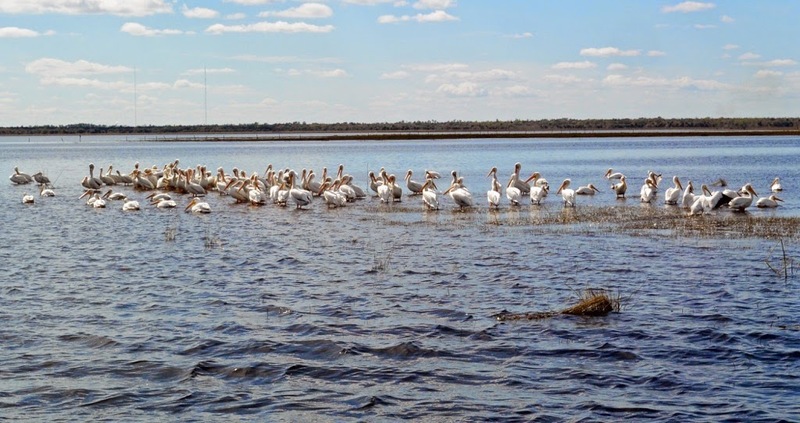 White pelicans were in especially high concentration while we were out...because, they like to eat shad...and they're not stupid. While they winter in the South, there's no better place to be than "Shad Alley." 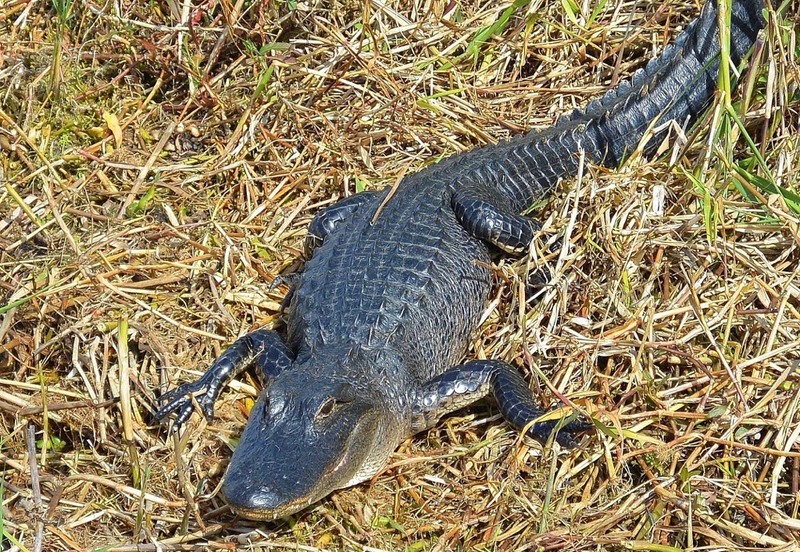 Oh, and did I mention the alligators...it's Florida after all, right? We saw two on the day, this one was somewhat cooperative when it came to taking pictures, although it really didn't care for us bothering its sunning. And I won't even get into the local "wildlife" piloting the multiple airboats and gyrocopter (yes, gyrocopter) zooming all around and about all over the place. Let's just say it was an amazing display. Overall, the day was a huge success. 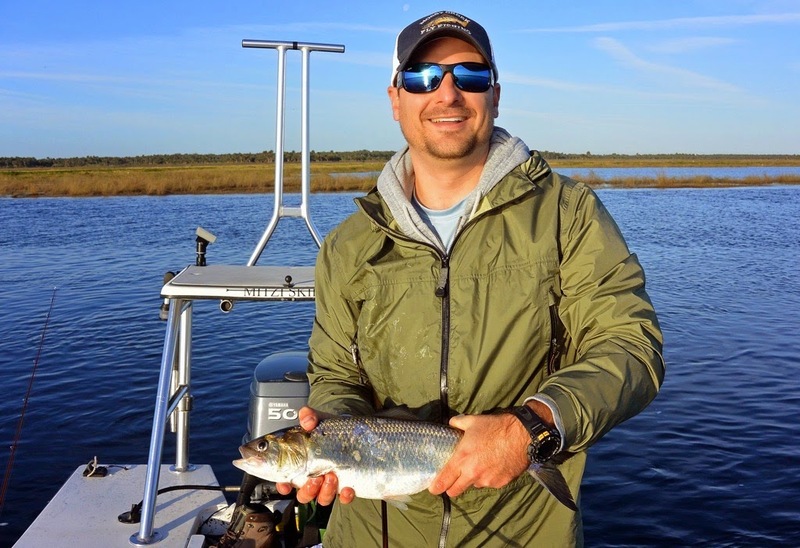 I scored my first 4.5 shad on the fly (the .5 is for the long distance release on the final one of the day), explored a very new and unique area to me which I'd recommend to anyone, and got to learn some new tricks from one of the best guides in Northeast Florida. Oh, and it was 70 degrees with beautiful blue skies the first weekend of February. It'd be real hard to top that again if I tried. 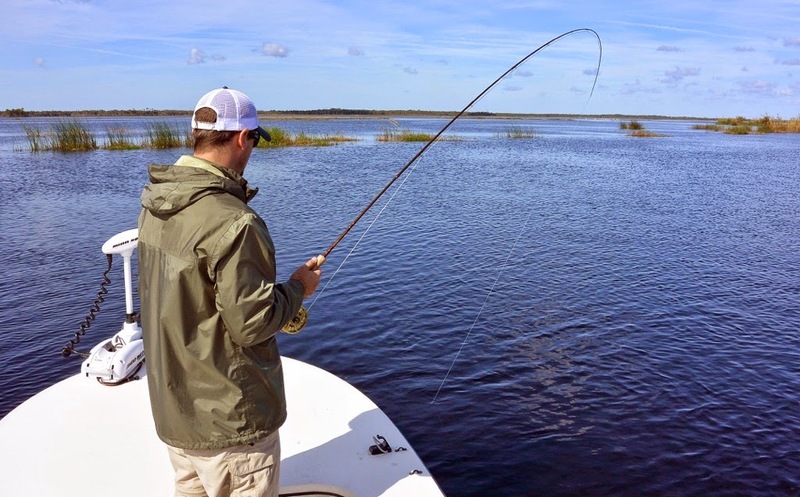 If you happen to be in the Jacksonville area and want to get a rod bent, a full list of Captain Rich's guide services (as well as many other resources) are available on his website flyfishjax.com.